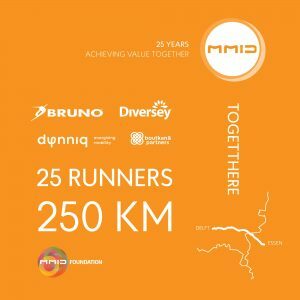 On the 24th of June, the day of MMIDs 25th anniversary, a team of 25 athletic MMID employees ran from the Essen office to Delft: a relay run of over 250 kilometers, benefiting the MMID Foundation. The goal of the relay run was to collect money for one of the projects the MMID Foundation will start in collaboration with the Better Future Factory. Do you still want to support this specific project of our Foundation? Read on for more information about the development of a sheet press for Angola.